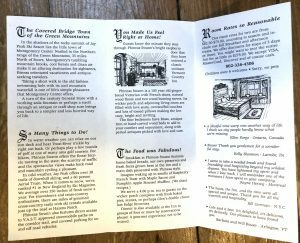 Our good friend Lynn Locher showed up over the weekend with a gift: An old brochure from the Phineas Swann she’s had since 1992. It was kind of her to give it to us, and it certainly adds to our trove of history regarding this house and the people who’ve made it what it is today. At first, it doesn’t appear that much as changed in the 30 years since this quaint brochure was made. But when you open it up, you see that some things are different, and a few things from the early 1990s went away, and have now made a triumphant return. What’s unchanged? Our distinctive purple front door had already made its appearance by 1992. Likewise mention of our amazing breakfasts. The Fireplace Room continues to be “cozy, bright and inviting,” and remains a central gathering place for guests at our inn. We’re still, as the brochure notes, surrounded by the Green Mountains, Stowe, “tumbling mountain brooks,” cool forests and clean air. What’s Changed? Our Raspberry French Toast morphed over the years into our even more popular Blackberry-Stuffed French Toast. While we still have many of the antique wooden beds mentioned, the brass beds have sadly gone away, since none were queen or king sized. Darren & Lynne said goodbye to the last full-sized bed in 2014, and now every bed at the Phineas is either a roomy Queen or a California King. We still offer an afternoon tea should guests request it, but most are too busy these days to take the time for a casual afternoon tea, sadly. The brochure mentions Jay Peak’s 38 trails. Today, Jay offers more than 70 trails for skiing. Gone and back? The brochure mentions “A turn of the century General Story with a working soda fountain.” Obviously a reference to Kilore’s Store, an institution in town that closed soon after this was published. But last year it reopened, this time as the Blue Bike Cafe. While they aren’t making full use of the soda fountain yet, you can still sit a the marble counter in front of it and enjoy a sandwich or ice cream just like 50 years ago. Also worth noting: Back in 1991, the Phineas Swann didn’t allow children 6 or under, or pets. Hard to believe a B&B that’s known worldwide for being one of the most dog-friendly hotels in the world started out as a pet-free venue. On final note. At first, we were impressed the price of a room in the Main House went for just $75 a night. But then, someone introduced us to the CPI Inflation Calculator. We quickly discovered that $75 in 1991 translates to about $140 in today’s dollars — which amazingly is the average price for a Main House room today.